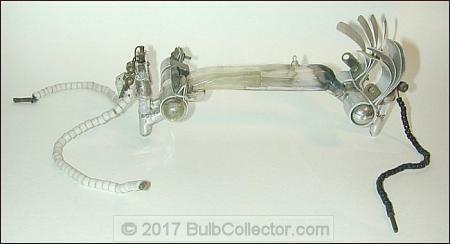 Quartz mercury vapor lamps such as the one pictured here first appeared in Europe around 191213. These lamps were not used as a source of illumination. They produce a considerable amount of ultraviolet rays and the lamps were used for water purification and in commercial quartz light therapy fixtures. Two different sizes of this style of quartz lamp are known to exist: a smaller direct current type and the larger alternating current type pictured here. Hanovia was one company known to the author that manufactured these lamps for their line of Alpine Sun Lamps14.